Good morning everyone! I have a really cute and easy hot chocolate treat for you today! It’s not the hot chocolate that you’re thinking. Instead these little snacks, are meant to look like a cup of hot cocoa, but instead, they’re sweet treats that will be sure to brighten any holiday party! And not only are these little guys adorable, but they’re super easy too! As a matter of fact this would be a great recipe to get your kiddos involved in. I know mine would enjoy decorating their own little cup of hot cocoa! Optional: Tiny red sugar sprinkles to top off your mug! If the video isn’t working in your browser click here to watch the DIY Hot Chocolate Cup Treats video tutorial! Lay your Oreos out on a plate. Top each Oreo with a small dab of frosting. Place 1 marshmallow onto each dab of frosting. Melt 1 cup of chocolate chips in a small microwave bowl on 20 second increments stirring in between until melted. Carefully spoon a little of the melted chocolate on top of each marshmallow. Place in refrigerator for about 5-10 minutes or until chocolate is mostly set. 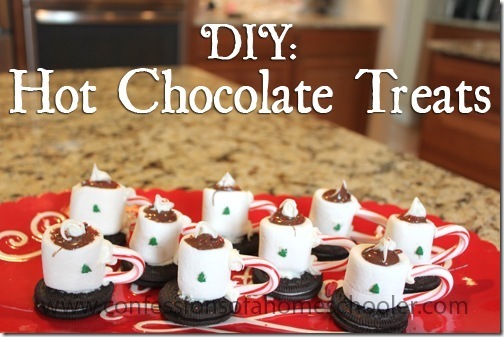 Place small dab of frosting on your mini-tree sprinkles (or whatever embellishment you are using) and attach them to the front of your marshmallow to decorate. Place small dab of frosting on the end of your candy cane handle and adhere it to the side of your marshmallow. Top each cup with a small dab of frosting and sprinkle with red sugar crystals. Let set until firm and bring them with you to your holiday gathering! These make really festive little treats and they’re pretty tasty too! I hope you enjoyed this recipe and that you are all having a merry Christmas!